Psyshock is increased to 300 damage instead of 150 and the HP is increased to 250 instead of 200. Flip a coin. If heads remove 2 damage counters from Mega Mewtwo EX. 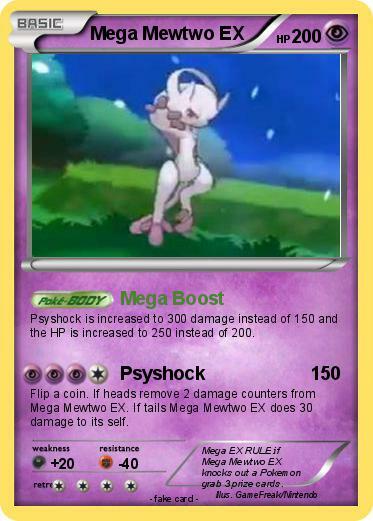 If tails Mega Mewtwo EX does 30 damage to its self. Comments : Mega EX RULE:if Mega Mewtwo EX knocks out a Pokemon grab 3 prize cards.